New-Book-by-Mickey-McGrath--from-World-Library-Publications - Benchmark Community New Book by Mickey McGrath--from World Library Publications! New Book by Mickey McGrath--from World Library Publications! New book by Mickey McGrath - from World Library Publications! 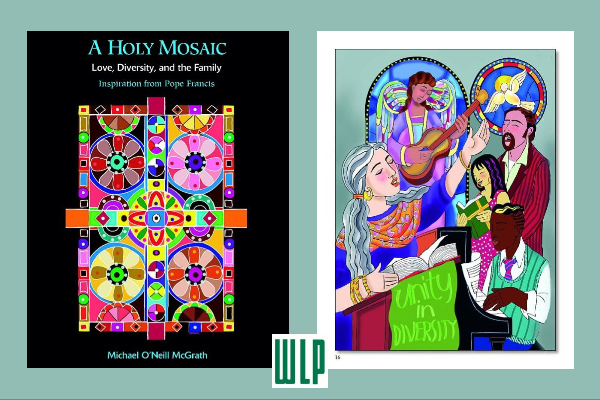 As a customer who previously purchased an art book by Mickey McGrath, we wanted to let you know that his latest book, A Holy Mosaic: Love, Diversity, and the Family, is ready to ship! The book is $20.00 from World Library Publications. The distinctive art of Brother Michael O’Neill McGrath has decorated countless churches, homes, and schools, and has inspired myriad pilgrims on their spiritual journeys. Brother Mickey’s trademark vibrant colors and lively drawings bring images and words to life. World Library Publications is proud to present the next volume from Brother Mickey (his eleventh with us!). A Holy Mosaic illustrates selected inspirational messages from Pope Francis on love, diversity, and the family, accompanied by colorful visual impressions. Those familiar with the striking style of Mickey’s art are captivated by the energy and vitality on each page, making these quotations memorable in the hearts and minds of the reader. Mickey adds his own introduction to each of the three chapters in the book. He writes from personal experiences that helped form and shape his life. The words of Pope Francis inspire each piece of art and each page can be a meditation to kindle an outlook of love toward all people, with their differences forming a beautiful mosaic of humankind. Click to see more from Mickey McGrath! You are receiving this email because of your relationship with World Library Publications. Please reconfirm your interest in receiving emails from us. If you do not wish to receive any more emails, you can unsubscribe here.